Pre-making my Christmas layouts gives me the opportunity to immerse myself in this year’s festivities without having to have all my photos ready and waiting to be scrapped. And, in the new year, I can just print out my pictures and stick them straight onto my pre-made pages. I can have my Christmas memories scrapped before the back to school season even starts! Of course, I have a million things going all at once at this time of year (tomorrow I’m testing a new recipe that I want to make for Christmas) so quick layouts are essential. Subsequently, for today’s page, I once again turned to my collection of 500 Scrapbooking Sketches. It’s the best way I’ve found for creating pages quickly and easily while still being able to infuse my creations with my own personal style. I created this layout in under an hour using Sketch #50 from my collection of 500 Scrapbooking Sketches. Materials Used: Green Bazzill cardstock, Sweetwater scrapbooking papers, cream cardstock, Bo Bunny Christmas stickers, green alphabet stickers and brown ink. 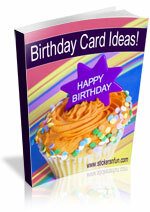 I made this page to showcase one special 4×6 photo. I followed the sketch exactly. It was a super-easy page to make, but I love how it turned out, especially with the stripes. Stripes are extremely versatile. As you can see, in this page, I used horizontal stripes at the side of my page. I then used the same striped paper to create my vertical stripe accent next to my photo. So simple! My title was very simple too. I used two stickers by Bo Bunny – one that reads ‘Magic’ and another that reads ‘Christmas’. I then joined them with two little alphabet stickers that read ‘of’ to give me my title, ‘Magic Of Christmas’. You could easily create something similar with any phrase or word stickers you have lying around…or create you own title with alphabet stickers, rub-ons, cut-outs or stamps. And, of course, since it’s a sketch, you just need to change the colours, patterns and words to create an entirely new page. In fact, I’m thinking of creating another layout just like it, but upside down. Try playing around with the design and see what you can create. The possibilities are endless. And, this is only from one sketch! There are another 499 sketches in my collection! 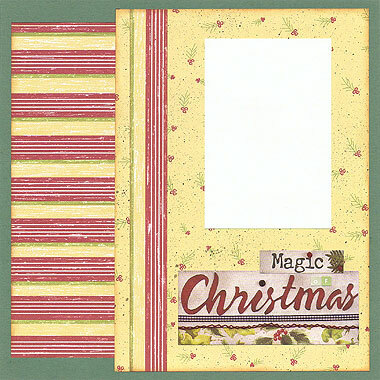 I’d love to hear what you think of my Magic of Christmas scrapbooking idea. Please leave a comment in the comments box below. This entry was posted on Wednesday, December 11th, 2013 at 11:28 pm	and is filed under Christmas, Quick Scrapbooking Ideas. You can follow any responses to this entry through the RSS 2.0 feed. You can leave a response, or trackback from your own site.